In infants, often the main sign of an ear infection is acting irritable or crying that cannot be soothed. 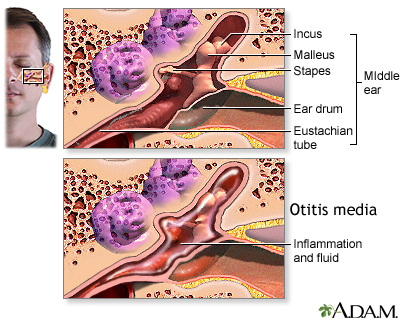 Many infants and children with an acute ear infection have a fever or trouble sleeping. 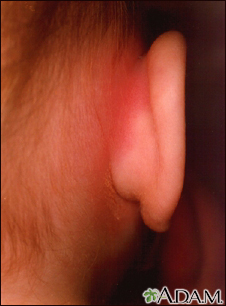 Tugging on the ear is not always a sign that the child has an ear infection. Let the provider know right away if a child younger than 6 months has a fever, even if the child doesn't have other symptoms. Wash hands and toys often. If possible, choose a day care that has 6 or fewer children. This can reduce your child's chances of getting a cold or other infection, and lead to fewer ear infections. 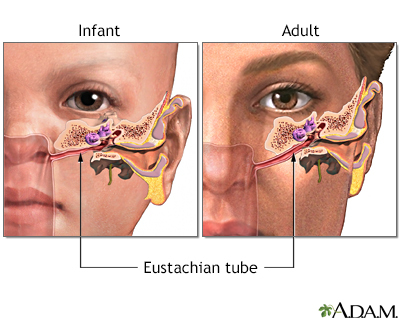 Breastfeed -- This makes a child much less prone to ear infections. If you are bottle feeding, hold your infant in an upright, seated position. Make sure your child's immunizations are up to date. The pneumococcal vaccine prevents infections from the bacteria that most commonly cause acute ear infections and many respiratory infections. DO NOT overuse antibiotics. Doing so can lead to antibiotic resistance.